Aaron’s phone I stepped on the gas to get home as fast as possible. slip n’ slide and were eating some of the food Alexa cooked. Kevin and Alexa’s friends Blake and his wife Rebecca were there along with Kevin’s college friend Matt and his sister Catie. 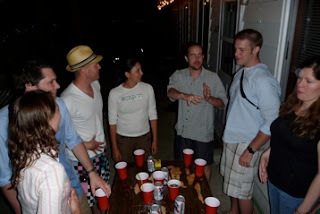 Colin and Amanda were there along with Mischa, Miwa, Cassie & Garrett, next door Kelly, and of course party maniac Danielle who quickly demanded a game of flip cup be started after everyone had eaten. I hung out and got some food and our stereo set up for louder music for everyone before I headed in to take a shower. I was sun-burned and very tired having only gotten about 9 hours of sleep over the past 48 but I felt much better once I got cleaned up. and Alexa had bought all the fixings for me to make Mojito’s for everyone so I set to work on that task pouring 4/5 of the handle into bowl and hand mashing the mint with sugar and fresh cut limes. I poured a few cups for everyone and it was a hit! Rebecca even said it was the best mojito she’d ever had... I attribute it all to the amount of sugar I put in! Alexa swore all night that I hadn’t put in any rum in the mojito’s.. which got funny when she started slurring her words saying it. I called Hartz and he came over to hang out with all of us as well. of us had to follow. Thankfully it was a warm night! After several more rounds Kevin had run off to Freddy’s and came back with a ton of energy drinks we started to use in our cups in place of beer. This livened us up for another couple hours of flip cup! By the end of the night everyone was trashed and Aaron had face planted out of the hammock! He ended up sleeping on our couch. It was a great party and congratulations to Kevin and Alexa!